Dallas/Ft. Worth--Beth has a gift of healing, which is why she wants to become a veterinarian and help her family run their fifth-generation cattle ranch. But it only takes one foolish decision for Beth to destroy it all. She quickly scrambles to redeem her devastating mistake, pleading with God for help, even as a disturbing mystery begins to unravel her life. But the repercussions grow even more unbearable—a lawsuit, a death, a divided family and the looming loss of everything she treasures. Can Beth ever truly be whole again? Best-selling Christian fiction author Erin Healy takes us on a fascinating journey into the stunningly rugged terrain of Southern Colorado in her latest thriller, House of Mercy(Thomas Nelson, August 2012).Confused, grieving, but determined to make amends, she embarks on a horseback journey across the harsh Rocky Mountains guided by a wild, unpredictable wolf named Mercy that may or may not be real. 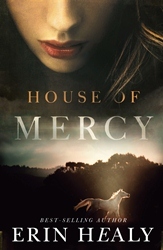 ­­Erin is known for creating distinctive settings that go hand in hand with the themes of her books, and House of Mercy is certainly no exception as her volatile emotional struggles match the challenging physical settings as she traipses across the rugged Rockies. At the same time, she wrestles spiritually with the notion of modern-day miracles. Garnering accolades from numerous sources, including being named Book of the Year finalist, Healy consistently turns out highly readable, captivating and informative novels that are awaited eagerly by her huge following of readers. Her previous best-sellers include Never Let You Go, The Promises She Keeps and The Baker’s Wife. She also co-authored with Ted Dekker best-sellers Kiss and Burn, and with House of Mercy, her readers will be thrilled once again. The story’s realism comes from Healy’s personal encounter with Colorado wolves, the Rocky Mountains and research done with Colorado ranchers. The reader will experience a “you-are-there” feeling as Beth’s adventure takes them through the craggy gorges, across tumbling rivers and finally to the mountaintop of mercy. It’s an adventure you don’t want to miss. One thing I really love about Erin Healy's writing is that she can create unique plots and situations. Her books don't follow just one theme or path, but are unique in the Christian fiction marketplace. You never know what you may get with them. She pushes the envelope into the spiritual realm, creating a thought provoking read for Christians and non believers alike. I received a copy of this book from The B & B Media Group to facilitate an accurate review. This book sounds amazing. I love, love, love to read! I am always in the market for a good book. thank you for the review. Looks like a great book. Looking into getting it.